Of course there’s another amazing start up coming out of Los Angeles (Silicon Beach if you will). This time Brian Lee, the founder of Honest Company, Shoedazzle and Legal Zoom has come up with a new, fun way to shop exclusive deals from your favorite brands and celebrities. TopFloor will be using entertaining videos to make discovering new and interesting products effortless and enjoyable (ummmm hellllllooooooo… shopping on the internet is always fun there’s no three way mirror and fluorescent lighting). 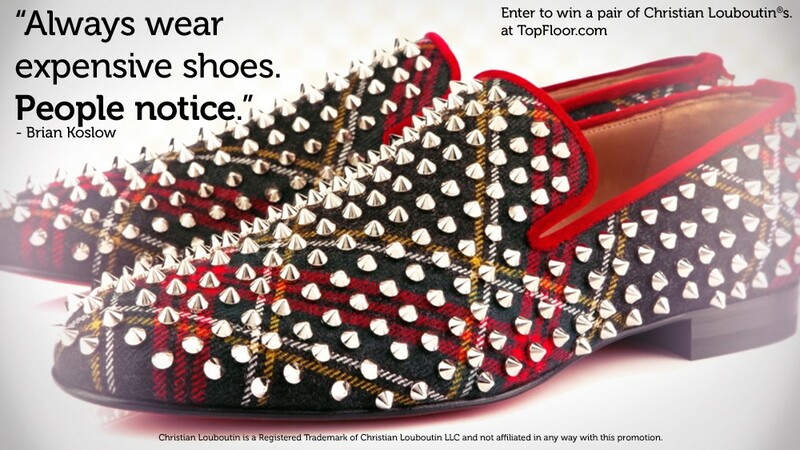 TopFloor hasn’t launched yet, but they’re getting ready to – and to celebrate they’re giving away 4 pairs of Christian Louboutins! Let’s be frank, I recently sold my last remaining Louboutins after trying to give them to my daughter for a school dance. I’m sort of “over” the red sole but then I was killing time in the shoe section at Barneys and saw these. And then angels sang I realized that I did, in fact, still love some of what Christian Louboutin makes. Good luck and if you win please send me a photo of yourself in your new shoes. I entered. I like the black flats a lot better than those bow tie heels you posted yesterday. If I win these will be my first pair of high heels. YES! I have some spiked shoes and it keeps little boys from kicking me under the dinner table. You can pick any pair you want. The only thing they’re guaranteed to have is a red sole and an enormous price tag.